When Pat Gallant-Charette became the oldest woman to successfully cross the English Channel this month. "On the day I swam the English Channel, it was very calm off the coast of France. Every so often I would feel the current lift me like I was going over a ridge. The following day, my son asked me if I could feel any unusual pattern in the current. He said that Phil of the Viking Princess explained that several ships had sunk during the war in that area. As the strong currents traveled up the coast, it would strike the sunken ships causing the water to lift slightly. I was very fortunate to experience it. Like many other channel swimmers I thought of the great loss of lives that occurred during the war." That loss of life was commemorated by two teams of six swimmers (three French and three Americans on each boat), organized by John Kulewicz. "The pilots were Michael Oram and Lance Oram. The team times were 13 hours 28 minutes and 14 hours 20 minutes. 'Un jour superb. Une équipe superb. Un nage superb. Vive la Manche. Vive la France. 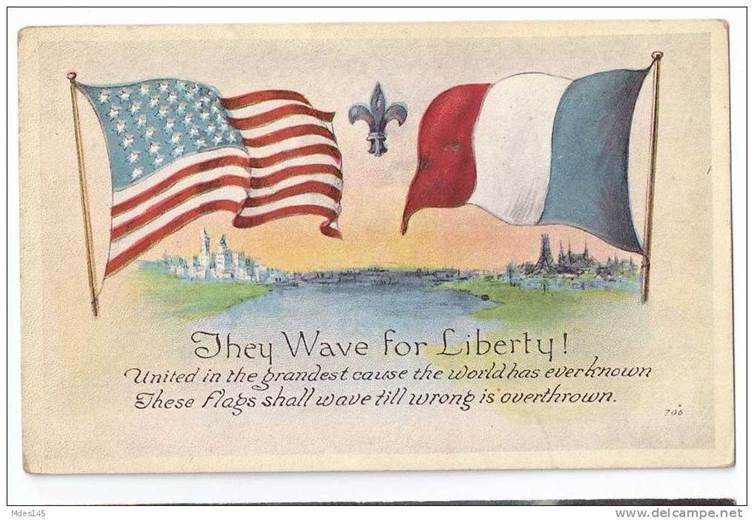 Vive les États Unis. Vive l'amitié entre nos deux pays. Et vive le mémoire des soldats qui ont protégé nos libertés pendant le Première Guerre mondiale.'" The 12 Over There! 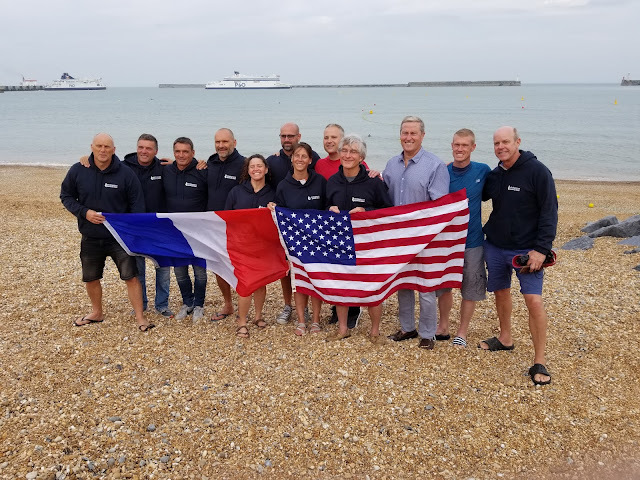 swimmers - including David Arnold, William Bonnet, Nicolas Costa, James Curphey, Nicolas Derrien, Alexandre Fleury, Philippe Fort, Eve Gaillard, John Kulewicz, Richard Lovering, Michelle Sanders, and John Stephan - crossed the English Channel to mark the 100th anniversary of the arrival of U.S. troops in France for World War I. One hundred years ago, a generation of American and French soldiers met on the shore of France to work in common purpose,” said team captain John Kulewicz who was a member of the Overlord 70 relay that crossed the English Channel in 12 hours 8 minutes on June 8th 2014 to commemorate D-Day (June 6th 1944 when the Allied troops landed in Normandy in Operation Overlord during World War II). Photo of the Over There! team above shows Alexandre Fleury, William Bonnet, Philippe Fort, Nicolas Costa, Michelle Sanders, Nicolas Derrien, Eve Gaillard, John Stephan, John Kulewicz, James Curphey, Dave Arnold and Rich Lovering.